As with last year I ventured into the cinema week by week, working my way through all the year best picture nominees. And as with last year my bank balanced decreased, and my love of cinemae increased. An outstanding performance which deserves the best actress for Frances McDormand. The dark comedic edge of a Coen brothers or Tarantino but with genine heartbreak and emotion. It's not the film the trailer made it out to be but I thoroughly enjoyed it. I laughed and I cried. It's charming, it's got a low-key indie feel and I think there is something quite universal about it. The film is set in 2002-03 as Ladybird heads off to university (the same year I did) so it was hard not to feel some resonance. It's unbelieveable that Greta Gerwick is only the fifth woman to be nominated for best director. I hope she wins. The success of Dunkirk give me optimism for more big budget films outside of superheros and franchises. This feels like the film that will be most remembered in the future. It's more about the experience than the plot but it's wonderfully made. Seeing it projected in 70mm was a joy. A fantastical gothical fable about a romance between a mute woman and a sea creature. Full of old-timey music and charm but Del Toro brings a dark edge that makes you never quite comfortable. Doug Jones and Sally Hawkins are great. Ultimately it reminded me that I must rewatch Pans Labyrinth. Get Out does so well at setting up it's sinister atmosphere with subtelty and without playing all its cards too soon. I'm not sure the last third of the film doesn't quite live up to the set up and falls into standard horror tropes. It's good to see diversity not just in the filmakers being nominated but also in the type of films - not just weepy bio-pics. I'm not sure it's the kind of film I would be eager to rewatch on Netflix on a Friday night, but I got swept up in it whilst watching it. It's hard to really describe it as having a plot; the high points of the film all involve Daniel Day Lewis eating breakfast. Johnny Greenwood's score is sweeping and romantic. I can't stop listening to it. Another coming of age film, about 17 year old Ellio, struggling with his sexuality and falling for an older PhD student. There is a lot I liked about it, and Timothee Chalamet convincingly portrays the awkwardness of adolescence. After Moonlights win last year I'm glad LGBT cinema continues to get recognised; I did find that casting 31 year old Arnie Harmer as 24-year old Oliver accentuated the age gap between the two leads in a way that left me slightly uncomfortable. It will make you want to move to Italy though. When Speilberg and Hanks and Streep get together they are not going to make a bad movie. It feels like it was made quite quickly and quite workman-like. Like an Channel 4 special about Vietnam that happens to start A-listers; I'd watch it if it was on, but it didn't feel in the same league as Spotlight. I'm sure Gary Oldman will win for Best Actor, and he puts on a fatsuit and does the Churchill thing well. Having watched John Lithgows Churchill in the Crown, I actually felt more engaged with his portrayal. The scene in the Darkest Hour on the subway was so incredibly on-the-nose and such an unabashed attempt to stir up British patriotism that I couldn't quite get past it. When I first wrote about Apple Watch after a year, I was positive about it as a fitness tracker, but it didn’t quite feel essential in the way a smartphone does. Wearing an Apple Watch for the first time wasn't an instant revelation like first holding an iPhone. After two and half years of wearing this tiny computer on my wrist, it has become an integral part of daily life. It has formed habits and deep roots. Maybe my personality and lifestyle was particularly susceptible to it, but those Activity Rings have completely drawn me in. I really shouldn't care so much about trying to fill some little circles, but I totally do. Technology improves our lives in many ways, big and small. Sometimes it can also leave us feeling trapped. We can become addicted to it and our interactions leave us empty and hollow. Like we are losing out on life rather than gaining it. I probably am a bit addicted to my Apple Watch. But it is in a way that leaves me feeling more positive, healthier both physically and mentally, and has opened me to exploring the city I live in. I can’t imagine taking it off anytime soon. I've travelled a lot recently and have been reflecting on the experience. I love this clip from the Netflix series Master of None 1 where the main character Dev wants Tacos, so goes on a quest to find the best ones. This is me most days when trying to make dinner plans. When I travel to a foreign city it's even more amplified. Overwhelmed with choice, with no frame of reference, trying to find the best place to eat often ends up feeling like work instead of relaxation. Websites like TimeOut and TripAdvisor become an all-encompassing part of the travelling experience. We went not really knowing what to expect, or what we would do. 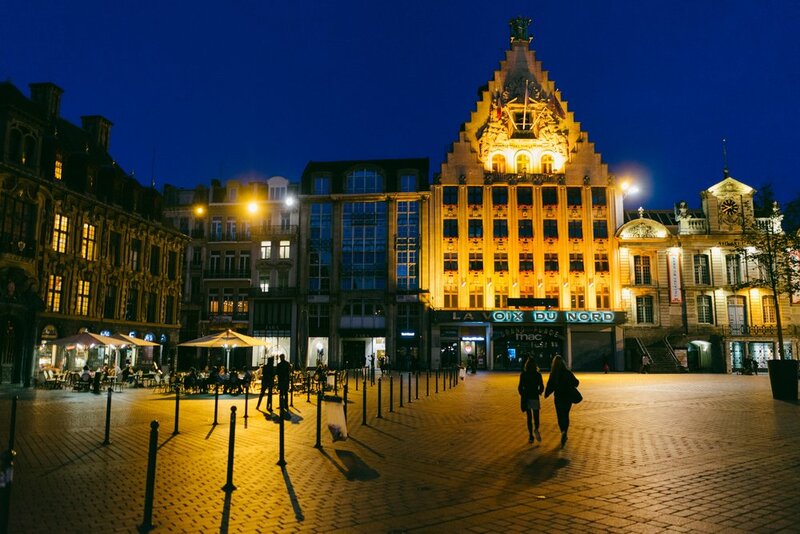 Lille is a beautiful city. It's small enough that you can get a fairly good grasp of it quickly, but the meandering streets of it's old town allow you to get lost in them. 3 It was August, a busy month for Edinburgh, but quite sedate in the North of France as everyone is on holiday. We had often had the streets to ourselves. There were some days where we just walked. Without purpose, without Google Maps, without knowing where we were going, or how long we were going to walk for. We stumbled on an open courtyard and drank Belgian beer in the sun. We found an amazing cocktail bar late one night in which some locals shared their food with us. Most of the memorable places we visited came from simply exploring. On our last night looking for dinner, we asked a barman for recommendations. His English wasn’t great but he happily obliged. He scrawled the name of a restaurant on the back of a napkin and pointed us in the direction of a little bistro not too far away. Was it the best food in the city? Maybe not, but it was good. The cosy small restaurant had buckets of charm; it made for a memorable evening. It felt more personal, as though we had been invited into someone else's world. Using your eyes and not your GPS. Asking people and not Google. Obvious advice, especially for the generations used to travelling before the internet. But when ratings websites and food blogs have made finding the 'best of the best’ the ultimate goal it was helpful to be reminded of these things. I don't want to over-romantise it - I have been to some amazing places around the world based entirely on online research, and will continue to do so. But I also want to recognise that a huge part of the pleasure of travel is discovery. And for that to happen sometimes my phone needs to stay in my pocket. Whatever you do get the waffles (Gaufre de Lille) from Méert. Try the local Flemish dishes, which seem to be a combination of beer, sugar and cheese. Unusual, delicious and calorific. Wander round the Fine Art Gallery and walk the gardens near the Citadel. Find a bakery and some baguettes, because it is still France. Paul bakery started in Lille, and while it is a chain, I can confirm their bread was delicious. For the last few years, I started a tradition where I would attempt to see every Best Picture nominated film in the run up to the Oscars. This year 9 films were nominated it was also the first year I succeeded in seeing them all in time. But I do it because it reminds me why I love the cinema. Most of the films that get nominated are at least interesting pieces of art in a way that modern blockbusters are not. I saw La La Land before it had reached peak hype; and then the inevitable backlash, and then the backlash to the backlash. I want to not like it as much as I do - it's a bit gimmicky in the way 'The Artist' was and is self-serving of Holywood. But I am drawn to it's deep sense of melancholy, I still find the music moving and it's the only one I want to go and see again. I'd be happy if it won. Purely as a piece of cinema, Moonlight should probably win. It's beautifully crafted. The music, the cinematography, the understated acting. It doesn't have the same emotional highs and lows as some of the others but instead is made with restraint and precision. I suspect this is one that will be remembered (at least critically) as the most important film this year. It's both funny and heartbreaking, brutally devastating and uplifting. Casey Affleck is the reason to see this film. A better film than I expected it do be. Jeff Bridges is very Jeff Bridges and Chris Pine turns out to delivery a surprisingly good performance. It is at some level speaking into the new American political landscape and the Nick Cave soundtrack holds it all together. I always love smart intelligent Sci-Fi and it was great to see Arrival do well. It had heart, a great performance from Amy Adams and uses sound to great effect. The first half of Lion is distressing yet amongst the poverty it somehow (paradoxically perhaps) looks completely beautiful due to the cinematography. The boy Sunny Pawar, is completely mesmerising. Dev Patel is great and does a good job in the second half of trying to make searching Google maps interesting but it doesn't quite live up to the first. I have mixed feelings about Fences - it moved me and has stuck with me more than some of the other films; Denzel and Viola Davis absolutely deserve the acting gongs. But you have to go in with the mindset of seeing a play. There is very little that is at all cinematic about it; especially compared to a film like Moonlight. It deserves every Tony award (which it has won) but I don't think as Best Picture. It's charming, it's fun, it has an important message and it's telling a worthwhile story; plus I'd watch any film about the space race. It's not breaking ground but it's mainstream film-making that will allow it to reach a wide audience and hard not to like. You should watch it because the true story on which it is based is incredible, and it is a legitimately a spectacle. But it's is tonally a bit all over the place. I think it wants the gravitas of Saving Private Ryan but the violence is so dialed up it feels it is played for shocks at times. Not to mention sections of broad comedy from Vince Vaughn. There probably isn't a time of the year I love more than August in Edinburgh. Much like when we complain about the weather, complaining about the festival is just an easily accesible topic of small talk. Doing so may bring us together and cement our identity but deep down I don't think we really want things to be any different. Edinburgh without the festival season just wouldn't feel like Edinburgh at all. We are proud of the fact that the world's biggest arts festival descends on our little city. Speak to a local and it won't be long before they tell you how the population of city doubles during the month of August.2 Edinburgh comes alive with a vibrant and pulsating energy and it's hard to be entirely cynical. I find this energy contagious. Wandering around the sea of posters advertising every available show, I feel the buzz that I get when I visit major cities like London or New York. One of the thing that brings me the most pleasure is walking back home late at night, camera in hand. George Square and the Pleasance are still abuzz with people who don't have work in the morning. Musicians and jugglers still perform to small crowds in the dim light of the Royal Mile. And every night is accompanied by the familiar soundtrack of fireworks. Right on cue. This year I tried to embrace it as much as I could. It was my most festival-y festival ever. The Fringe is often synonomous with comedy but it is also home to some unique experiences you won't find elsewhere. In total I saw 22 different shows, bands and events. I saw Edinburgh Castle light up with 350 million years of history. I saw Driftwood, an engrossing and gasp-inducing display of acrobatics inside an intimate venue. I saw Mark Watson deliver another set which proved himself to be one of the most reliable members of the Fringe establishment. I saw an elaborate technical show, Wifi Wars, go so horrible wrong that they resorted to singing Eminem covers on a Ukulele while someone tried to restart all the routers. I saw Nish Kumar deftly switch between innocuous material on his desire to be the drummer in Coldplay to Brexit, bankers and gentifrication by the middle classes. I saw Sigur Ros at the playhouse where they were not so much making music as a providing a sensory experience. I saw Louis CK at the playhouse received like a rock star with comedy that took cynicism to a whole new level. In the best possible way. I saw a somewhat crass, Australian foul-mouthed puppet reflect on the nature of life and whether we should sacrifice being a decent person in order to make good art. I loved it. I saw Abandoman improvise a rap about my problems getting Wi-Fi reception in my bedroom. I saw quite a lot of improv; including an improvised musical and an improvised album. I saw a musical about the true story of a group of migrants from Glasgow fighting to have the law changed. With feel good song and dance numbers. I saw Last Dream (On Earth), an immersive, technically astounding live audio experience recreating both a refugees journey to Spain and Yuri Gagarin in space. I saw some alcohol experts turn a drinks tasting into an hour long show involving dodgy puns and cross dressing. The drinks were a lot better than the jokes. I saw James Acaster deliver a slow-burn of a stand up set that was exceptionally well crafted and delivered with immense precision. Mainly about honey. I saw James Thiérrée, grandson of Charlie Chaplin in a surreal, strangely beautiful, Dali-esque piece of theatre. And in which everyone ended up getting eaten by a giant polythene toad. I (eventually) saw Kieran Hodgson in a charming hour of autobiographal character comedy after what was surely the most stressful and insane queuing system in the entire city. It brought everyone together. I saw Sam Beam (of Iron and Wine fame) and Jesca Hoop bring their beautiful harmonies to end the month in the most perfect low-key way. And I gathered with friends in Princes Street gardens, drank some wine, shared some food while we watched it all finish with a bang. Thank you Edinburgh. See you next August.